Malaysia’s AirAsia X turned a small operating profit for 1Q2015 and is optimistic it is on track for completing a turnaround in 2H2015. But market conditions in Malaysia remain challenging and not all competitors may follow AirAsia X in adopting a more rational approach to capacity and pricing. The Malaysian-based long-haul low-cost carrier cut capacity in 1Q2015, driven by a 21% reduction to Australia. But its load factor dropped by an alarming 12ppt and yields improved less than expected. This is Part 2 in a series of analysis reports on Malaysian airlines. The first report examined the outlook for Malaysia Airlines (MAS), which is starting to reduce capacity and head count as part of its own restructuring initiative. Malaysia AirAsia X (MAAX) has been in restructuring mode since Nov-2014, when it reported its fourth consecutive quarter of operating losses. MAAX accumulated MYR348 million (USD107 million) in operating losses from 4Q2013 through 3Q2014. The carrier had a double-digit negative operating margin during this period as it struggled to contend with overcapacity in the Malaysian medium-haul market, in particular to Australia and some parts of North Asia. Australia and North Asia currently account for about 87% of MAAX’s seat capacity. MAAX pursued ambitious expansion in late 2013 and early 2014 while MAS also expanded rapidly, leading to irrational price wars. The market was already oversupplied prior to the MH370 and MH17 incidents, which exacerbated the situation as demand was impacted particularly from China. MAS and MAAX continued to maintain capacity levels throughout 2014, further pressuring yields. MAAX’s ASKs were up 43% in the 12 months ending 30-Sep-2014, a staggering figure which in hindsight was overly ambitious. ASK growth initially slowed to 8% in 4Q2014 and ASKs declined by 3% in 1Q2015 compared to 1Q2014 levels as MAAX began cutting capacity. 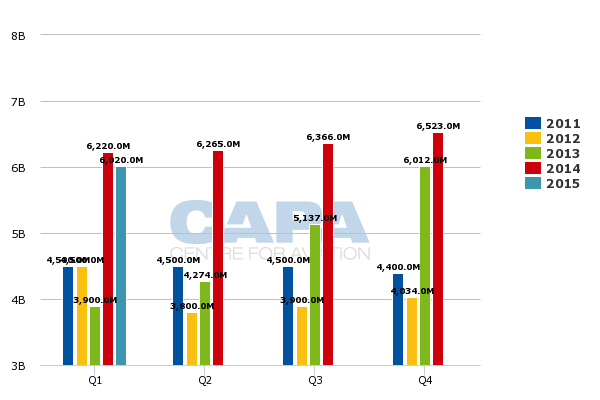 The 6.020 billion ASKs flown in 1Q2015 represented the lowest quarterly ASK figure for MAAX since 4Q2013. MAAX last had a decline in ASKs in 2012, when it cut flights to Europe, India and New Zealand as part of a prior restructuring. 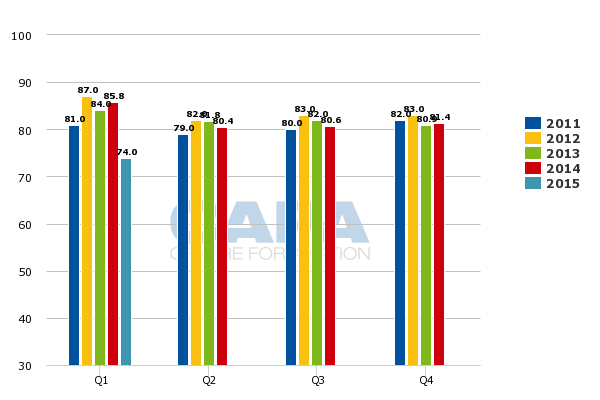 MAAX was back in the black on an operating level in 4Q2014 and 1Q2015. The airline reported on 27-May-2015 an operating profit of MYR6 million (USD1.7 million) in 1Q2015 compared to an operating loss of MYR33 million (USD10 million) in 1Q2014. This follows an operating profit of MYR90 million (USD27 million) in 4Q2014 compared to an operating loss of MYR40 million (USD12 million) in 4Q2013. But it is too early to deem Malaysia AirAsia X's turnaround complete. Lower fuel prices drove the improvement in operating figures in 1Q2015 as MAAX saw a sharp decline in load factors and a relatively modest improvement in yields. MAAX benefitted from a 32% drop in fuel costs in 1Q2015 although it reduced ASKs by only 3%. MAAX’s operating figures are still well shy of the figures from the first part of 2013, before market conditions in Malaysia started to become unfavourable. In 1Q2013 MAAX turned an operating profit of MYR58 million (USD18 million) despite much higher fuel prices. MAAX paid an average fuel price of USD136.31 per barrel in 1Q2013 compared to USD83.94 in 1Q2015. MAAX average fares increased by 8% and unit revenues improved by 7% in 1Q2015. The group sees this as an indication that its initiative aimed at boosting yields is making some progress. But when compared to 1Q2013, the 1Q2015 average fare for MAAX was still down 19% and yield or RASK was down 6%. In reporting 4Q2014 results in late Feb-2015 AirAsia X stated it was aiming to improve average fares by 16% in 2015. This could prove difficult to achieve, particularly if MAS does not cut capacity on competing routes. MAS currently serves 12 of the 19 routes that are served by MAAX. The AirAsia Group has stated it expects MAS to cut capacity by 20% to 30%. But such projections seem overly optimistic. AirAsia and AirAsia X were initially expecting capacity reductions from MAS in 2H2014 but these never materialised. As outlined in the first report in this series, MAS finally began cutting capacity in recent weeks. However, the cuts have so far been relatively modest and none of the four routes that have been suspended are served by AirAsia X.
AirAsia X has taken the lead so far in taking a more rational approach to capacity. AirAsia X dropped two routes in 1Q2015 while reducing capacity on five other routes. MAS serves both of the two routes which were dropped by AirAsia X and three of the other five routes. MAS has so far maintained capacity in all these markets. The MAAX capacity cuts have not yet resulted in load factor improvements and have led to only relatively modest yield improvements. MAAX’s average load factor dropped by 12.2ppts in 1Q2015 to 73.6%. This represents by far the lowest quarterly load factor for MAAX in five years. MAAX’s load factor has been consistently in the low to mid 80s in recent years. Passenger numbers were down 15% in 1Q2015 while RPKs were down 17%. The 915,000 passengers carried in 1Q2015 represents the lowest quarterly passenger number for AirAsia X since 3Q2013. Scheduled passenger revenues also dropped by 9% to MYR460 million (USD127 million). But total revenues were still up 3% to MYR775 million (USD235 million) driven by an increase in aircraft operating lease income (from A330s leased to affiliates in Thailand and Indonesia) and in charter and wet-lease operations. MAAX attributed the drop in load factor to a halt in marketing activities across the AirAsia brand following the crash of an Indonesia AirAsia A320 in late Dec-2014. 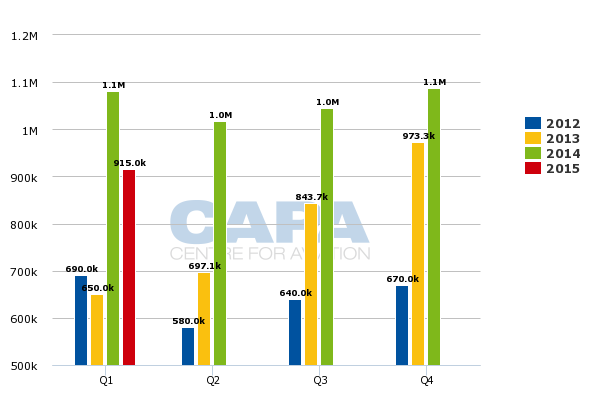 But MAAX had by far the largest load factor drop in 1Q2015 among all AirAsia affiliates. Indonesia AirAsia and Malaysia AirAsia for example both saw their seat load factors drop by a more modest 6ppts. The large drop in load factor at MAAX was likely driven more by a new pricing strategy which AirAsia X initiated in late 2014 in an effort to push up sagging yield. While yields did improve the gains were not nearly enough to offset the lower loads. MAAX’s load factor will need to return to its normal levels – without impacting continuing efforts to boost yields – for the AirAsia X Group to meet its aspirations for significantly improved profitability in 2H2015. The investment community at least for now seems unconvinced that AirAsia X will be able to complete the turnaround. 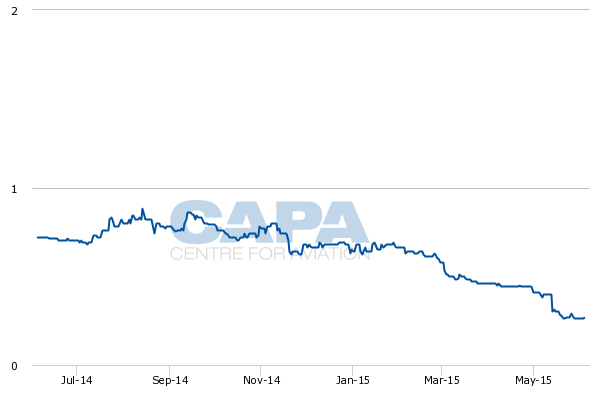 The company’s stock price has dropped steadily since its Jul-2013 initial public offering. AirAsia X stock is currently trading down by more than 60% compared to one year ago and by almost 80% compared to IPO levels. AirAsia X’s balance sheet should get a much needed boost in mid Jun-2015, when it expects to complete a rights issue which will raise MYR391 million (USD105 million) in fresh capital. AirAsia X also has been raising capital by selling and leasing back A330s. But the group will ultimately need to improve its bottom line. While MAAX has been back in the black on an operating level the last two quarters the group continues to incur net losses. AirAsia X’s net loss widened in the most recent quarter from MYR11 million (USD3 million) in 1Q2014 to MYR126 million (USD35 million) in 1Q2015 due mainly to the depreciation of the Malaysian Ringgit. AirAsia X recorded a foreign exchange loss of MYR87 million (USD24 million) in 1Q2015 compared to a gain of MYR10 million (USD3 million) in 1Q2014. The group’s net figures also include contributions from its two affiliates, Indonesia AriAsia X (IAAX) and Thai AirAsia X (TAAX) while its operating figures only include MAAX. TAAX was profitable in 1Q2015, posting a net profit of THB90 million (USD3 million) and average load factor of 82%. TAAX launched services in 2Q2014. IAAX is not yet profitable but only launched operations in 1Q2015. The Malaysia-listed AirAsia X Group recorded a MYR15 million (USD4 million) loss in 1Q2015 associated with its investment in IAAX. The AirAsia X Group is focusing expansion in 2015 in Indonesia and Thailand, where there are more opportunities for growth in the medium-haul sector. The initial AirAsia X Group fleet plan for 2015, which was released in late Feb-2015, envisioned five A330-300 deliveries for TAAX, two for MAAX and one for IAAX. TAAX and IAAX both began 2015 with two A330s although the IAAX aircraft had not yet entered service due to delays in securing approvals from Australian authorities which were eventually resolved. AirAsia X has since decided to sell two of its 2H2015 A330-300 delivery slots and as a result will now take six aircraft in 2015 instead of eight. The group stated during its 1Q2015 results presentation that TAAX is now expected to end 2015 with a fleet of six to seven aircraft instead of the eight aircraft originally intended. The decision to slow down the rate of expansion at TAAX is sensible given the new constraints the start-up faces in expanding in the Japanese and South Korean markets. As CAPA previously highlighted, TAAX and other Thai carriers are not able to add flights to Japan and South Korea until the Thailand DCA resolves the concerns that were raised by ICAO in Mar-2015. Japan and South Korea are the main target markets in the initial business plans for both TAAX and medium/long-haul low-cost start-up NokScoot. The new restrictions do not impact TAAX’s existing services to Osaka, Seoul and Tokyo Narita, as all these flights were launched in 2014. But to maintain its recently launched service to Sapporo TAAX has had to start using aircraft and crews from MAAX. The AirAsia X Group plans to continue operating Bangkok-Sapporo using MAAX aircraft and crews until Thailand’s DCA meets the ICAO standards, enabling Japanese authorities to lift the current restriction blocking expansion by Thai carriers. This likely explains why the group says TAAX will end 2015 with between six and seven aircraft as it is unclear if these restrictions will be lifted in 2015. If the restrictions are lifted by the end of the year the A330-300 now being operated by MAAX for the daily Bangkok-Sapporo route should be transferred to TAAX. The other three A330s TAAX are still slated to receive by the end of 2015 will be allocated to other markets. The group has stated that TAAX is planning to launch services to Tehran in Iran and is seeking to launch services to Dalian and Qingdao in China as well as Melbourne in Australia. The AirAsia X group also stated in its 1Q2015 results presentation that IAAX plans to launch services to Jeddah and Sydney and is also seeking to serve Brisbane and Tokyo. IAAX currently only serves Taipei (four times per week) and Melbourne (five times per week), resulting in a relatively low average utilisation rate for its two A330-300s. IAAX will likely still receive a third A330-300 in 2H2015 as up to four new routes are launched. The original AirAsia X Group fleet plan envisioned two more A330-300s for TAAX in 2016 along with one for IAAX and one for MAAX. But the group stated in its 1Q2015 results presentation that it is now planning to defer two of these aircraft, which would give it a total of only two A330 deliveries in 2016. This is a sensible move as it reduces capital expenditure at a time AirAsia X needs to focus on turning around rather than strategic expansion. AirAsia X was previously looking at resuming expansion in Malaysia in late 2015 and 2016, including potential new routes to Europe. But given the recent adjustments to the group’s fleet plan it now seems that MAAX capacity levels will likely remain at relatively low levels. The group will almost certainly continue growing in Indonesia and Thailand in 2016, particularly if the current restrictions on expansion in the Thailand-Japan and Thailand-South Korea markets are lifted. If the group ends up with only two aircraft deliveries in 2016, AirAsia X may look to further shrink the fleet in Malaysia in order to free up more capacity for Indonesia or Thailand, where there are generally better opportunities for growth. MAAX has some flexibility in its fleet as currently some of its aircraft are being used for charters and wet-leases outside the group. The charter and wet-lease commitments run through 3Q2015. AirAsia X has been planning to use these aircraft to put capacity back into the Malaysian market in 4Q2015 by launching new routes and resuming frequencies which have been cut in recent months, particularly to Australia. MAAX recorded a 21% decline in ASKs to Australia in 1Q2015 as it dropped Adelaide and cut frequencies to its four remaining Australian destinations – Gold Coast, Melbourne, Perth and Sydney. MAAX revenues on Australian routes declined by 18% in 1Q2015 to MYR246 million (USD68 million). But the group may be better off using these aircraft to instead pursue opportunities in Thailand and Indonesia, or to extend charter or wet lease contracts if conditions are challenging across all its markets. This flexibility is valuable as AirAsia X will want to avoid a repeat of the overcapacity scenario it faced in 2014. Australia was a particularly challenging market in 2014. AirAsia X’s Australian routes have started to record operating performance improvements but MAAX needs to be careful not to derail a potential recovery by adding back capacity too quickly. This is particularly important given IAAX’s Mar-2015 launch of services to Melbourne and the planned launch of IAAX services to Sydney and Brisbane as well as TAAX services to Melbourne. These new services will inevitably lead to the shift of some AirAsia Australia traffic which had been connecting in Kuala Lumpur to instead connect in Bali and Bangkok. MAAX also is planning to start allocating capacity to fifth freedom markets, which has emerged as another alternative for reducing the group’s exposure to the intensely competitive Malaysian market. In early Apr-2015 AirAsia X unveiled plans to launch four weekly flights from Kuala Lumpur to Honolulu via Osaka from 1-Nov-2015, pending regulatory approvals. While AirAsia X will offer a one-stop service from Malaysia to Hawaii, most passengers on the Osaka-Honolulu leg are expected to be Japanese tourists. MAAX is now exploring other potential fifth freedom markets including Australia-New Zealand. It is also studying potential new “unique” routes from Kuala Lumpur which have limited or no competition. But the main focus at MAAX is on cutting costs and growing top line by improving yields and growing ancillaries. Already probably the lowest cost airline in the world, it is targeting a reduction in CASK of 10% in 2015 through several initiatives including operating with one less flight attendant, eliminating overnight stops for crews on several routes, renegotiating ground handling contracts and sharing more resources with sister short-haul carrier Malaysia AirAsia. MAAX needs to maintain this focus on costs and avoid any significant expansion until it clearly is on the path to recovery. Capacity adjustments at MAS or other competitors can hardly be guaranteed.